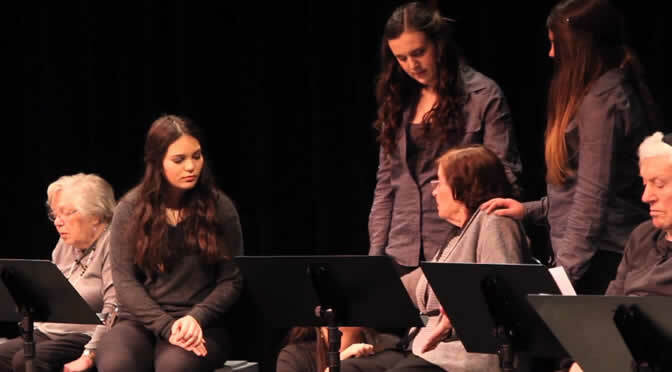 On April 8, 2013 at the Berman Center for the Performing Arts in West Bloomfield, Michigan, a group of six Holocaust survivors and five high schools students performed in a Witness Theater project in front of an audience of 400. Under the direction of Corrine Stavish, professor of Speech and Literature at Lawrence Technical University, the group met on Thursdays for eight months at the Fleischman Residence of Jewish Senior Life in West Bloomfield. Witness Theatre is a project in which Holocaust survivors and high school students come together and the teens learn about the survivors’ histories and about the survivors as real people. The teens then have an opportunity to tell the survivors’ stories in their respective communities in a theatrical performance. This particular Witness Theatre cast of six Holocaust survivors consisted of three men and three women. Two of the survivors were hidden child survivors from France and Holland; three were Auschwitz survivors, and one woman was a resistance fighter with partisans in Poland. There were also five teens participating, aged 15 to 18. Four of the five were young women; the sole young man was also the only non-Jew in the cast. The group performed on April 8, 2013 and it is both interesting and wonderful that the teenagers have wanted their connections with the survivors to continue to this day. Interestingly, the one non-Jewish young cast member, in particular, was very moved during this opportunity to know Holocaust survivors. As a non-Jew, he seemed to have a great sensitivity for what the Jewish people went through during the Holocaust. He was motivated to continue the relationships with the survivors after Witness Theater was over and became the catalyst in organizing reunion dinners and continuing visits with the survivors. Three of the survivors lived at the Fleischman Residence in West Bloomfield, an assisted living facility. The teenagers would visit Fleischman to see them. Conversely, the survivors loved seeing the young people during these times. They would ask them about school and how their lives were going. Since this Witness Theater project ended, two of the survivors have passed away. The students attended the funerals of both as well as going to their Shiva’s. Special memorial services were also held where the students talked about how special their survivor friends were to them. The eight months of meetings with the survivors and teens created lasting bonds of respect, friendship, and love. One of the most striking aspects that I observed about Witness Theater was the tenderness and the genuine caring that the students demonstrated to the survivors. Several of the survivors were elderly and over the course of the eight months of our meetings, one could visibly see how two of the survivors were becoming more and more frail and forgetful. The students recognized this. During the course of the rehearsals and during the play itself, it was very touching to see how the students were there to support and help the survivors. It was so moving to see how the young were so respectful in the caring of the old. I have also found it interesting that the students were now similar in age to the ages when the survivors were captured by the Nazis. The teenagers seemed to have a special emotional bond with the survivors, as a result. They had the awareness that this could well have happened to them. The students came away with a greater appreciation for the lives that they now have. They appreciated that they were fortunate to be born and live in a time of freedom and tolerance. Had they lived in the same era and circumstances in Europe as the survivors, they too would have experienced the horrors that the survivors went through. They came away with a sense of gratitude for living in the time and place that we are fortunate to live in. The survivors, in turn, saw the students as having the opportunities to live a free life that they wished they could have had. The survivors were very supportive to the students and encouraged the teenagers to get a good education and try to fulfill their dreams. The survivors commented on how much they appreciated living in the United States and the freedoms and opportunities that exist in our country. This was in stark contrast to the anti-Semitism that they largely grew up with which ultimately culminated in the Holocaust. They wished that they themselves had not gone through the horrors that they had gone through. They were happy that the American students as well as their own grandchildren live in this free and open land, and have opportunities to have a good future. Such projects where the young get together with survivors seem so rewarding for all. The students felt enriched knowing the survivors; the survivors felt enriched knowing the young people. The students learned to love and respect this very special population. Unfortunately, with the later loss of two of the survivors, they learned firsthand about the effects of loss and grieving. They learned how life is so very precious. It was an experience of a lifetime.